Free referrals to local bagpipers for weddings, funerals and other events. Bagpipers listings by city: - (for more photos of Bagpipers, please scroll down the page). PRICES:Approximate prices are 0-300 for ceremonies and funerals. Other events are based on location, date and times. All Time Favorites Minnesota Bagpipers. Since 1982 We have helped over 300,000 clients connect up to anything they need for events, nationwide. 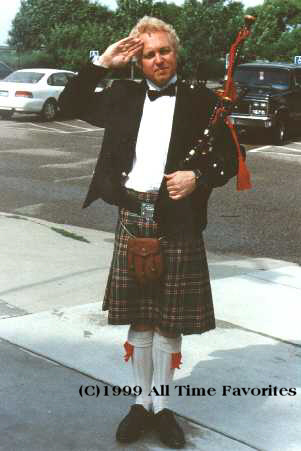 Donald K. Ross Bagpiping Michigan Bagpipers. Pipe Sgt. of the St. Andrew's Pipe Band. This is my 45th year of playing the Great Highland Bagpipe. Traditional Scottish & Irish music with some none traditional pieces. Bagpipe music for all occasions. Weddings, Funerals, Memorials, Anniversaries, Birthdays. Make your next event more memorable. Hire a Bagpiper. Want something special. Make the bagpiper a surprise. Appraisals Now, Inc. Oregon Bagpipers. You can read more about me on the GigMasters.com website. Simply type �Bagpiper� and the name of your "City" to find me. Audio samples are also available on that site. Cascadia Piper llc Oregon Bagpipers. I started playing bagpipes when I was 14 years old in San Diego where after 2 years I was a member of the Grade 2 West Coast champions, The House of Scotland Pipe Band. I played numerous funerals including the highest ranking non-commissioned officer for the Marines, the director for all of the military special forces, 100s of naval retirements, and many other military services. I've won numerous bagpiping events and competed all through-out the west coast. In 2009 I moved to Portland Oregon. Bagpiping for all Occasions Virginia Bagpipers. Norm Weaver has played the bagpipes for more than 23 years. For the last 20 years he has been a member of the Washington Scottish Pipe Band, pipers to the Saint Andrew Society and to the Clan Gregor USA. 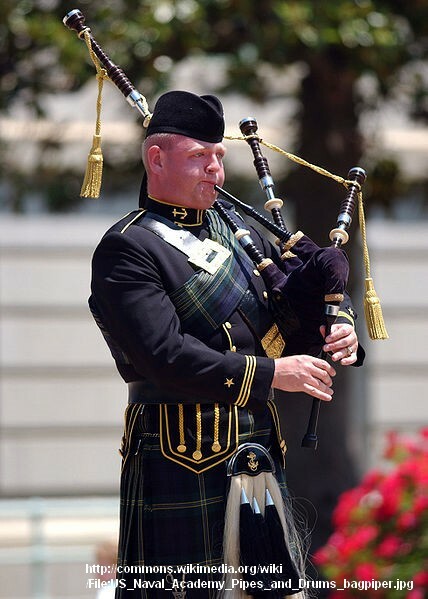 As a member of the band, he has played in the National Cathedral for the annual Blessing of the Tartans, in numerous Highland Games, community concerts, memorial services for Saint Andrew Society members, and for many community activities. He has also played for a variety of ceremonies in the Northern Virginia and other Washington D.C. metropolitan areas including: Community celebrations, Many wedding services and receptions, National and International conferences including a major dinner meeting in the Library of Congress, Church services, Private parties, Fashion shows, School events, Grave-side services in the Arlington and Quantico National Cemeteries, Memorial service for the Princess Diana in Northern Virginia, Memorial services in funeral homes, places of worship, and cemeteries. Texas Bagpiper Texas Bagpipers. I have been performing on the bagpipe for over twenty years and been doing this full-time for the last twelve. Michigan Bagpiper for All Occasions Michigan Bagpipers. I have been a bagpiper for 25 years as a senior member of the medal winning pipe band Michigan Scottish Pipes and Drums. For 11 years I have been piping professionally in the Metro Detroit area; piping for weddings, parties, funerals, corporate events, school and public library ethnic diversity programs, Guinness beer distributors, Grand Openings of all kinds and dedications for the Fallen Heroes Memorial Foundation. fortworthbagpipers.com Texas Bagpipers. Lary has been performing in the southwest for the past decade. He has piped nearly every conceivable bagpipe event, traditional and non traditional. Looking for a little Flintstones or Star Wars at your event? Andrew Fusco Nevada Bagpipers. I have been piping for 16 years and performing for weddings, parties, funerals, etc for about 12 years. I am a full time piper and pipe teacher and have hundreds of performances under my belt and can handle almost any request. Phil Nannery Virginia Bagpipers. Playing the Pipes for over 20 years. Piper Jonas California Bagpipers. I have been actively performing bagpipes at weddings, birthdays, memorials, and funerals for over eight years. R K Bagpipes Texas Bagpipers. Professional bagpiper for 30 years. Ian Briggs Kansas Bagpipers. I am an ex Scots Guards Piper and have travelled extensively playing for British Airways. I am available for weddings, funerals, parties and corp[orate events. In fact, any function where you think the skirl of the pipes will enhance the day. Kelly Faulkner Rhode Island Bagpipers. Kelly Faulkner has been playing the Highland bagpipes for 15 years. She competes regularly and receives awards for quality musicianship. Kind, professional, and flexible, she has experience playing both solo and group events. Willing to travel; prices start at 0. The Wedding Piper Ontario Bagpipers. I started piping in 1978, with the Brighton Legion Pipeband. �I have been a piper with the White Heather Pipes and Drums from Aurora, the Belleville Highlanders, and the Trenton and District Pipe Band. �I am currently a member of the Georgetown Pipe Band. �During my time with the Trenton and District Pipe Band we achieved Pipe Band Champion Supreme, twice. Over the past 39 years, I have been honoured to pipe at many weddings, funerals, graduations, and corporate functions. Symphony Studios, Inc Pennsylania Bagpipers. I have been playing professionally for 25 years. I play weddings, funerals and special events. I also teach music privately and am the founder of 2 pipe bands. SCOTT BARTELL Minnesota Bagpipers. I have 30 years experience in the U.S. and Scotland. 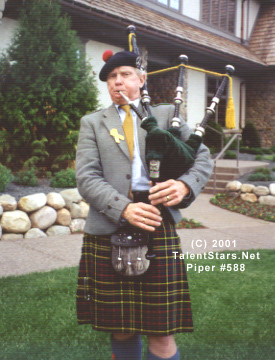 I teach and compete, was for years official piper for the Minnesota Marathon, can speak Gaelic, give toasts, tell jokes or stories, explain the music and culture and can arrange special needs.